I’ve been doing consulting on marketing personalisation and social proof optimisation for a while on the side now. But it has always been word of mouth and never via a ‘real’ offering (eg with a brand, concrete product/service to buy, landing page etc). As I stated in my goals for 2019 post, it has been dawning on me for a while now a) how much value I can provide clients with a structured social proof consulting service, and b) that I’m probably the best person they could currently hire to get those results. 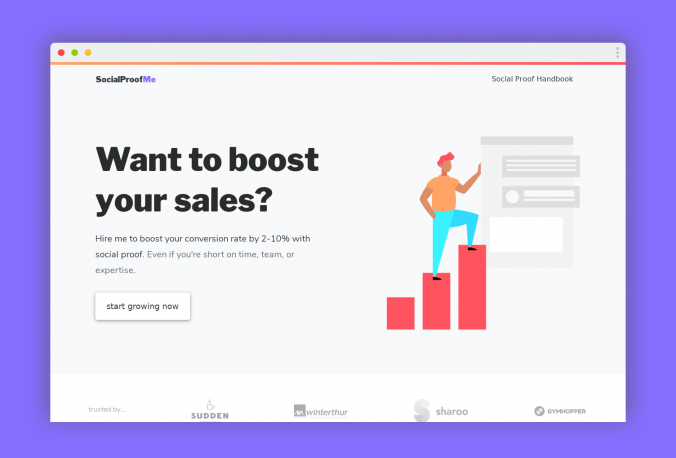 I’d love for companies (especially early stage startups and indie hackers) to be able to get some of the results by doing the work themselves with my Social Proof Handbook and the examples I’m highlighting in the Social Proof Gallery. But the simple truth is that a lot of companies want the results but are missing either the capacity, skillset* or timeframe to read the handbook and do it for themselves. These companies should hire me to optimise their social proof instead! To make it easier for clients to find and book me, I needed to put together a) a service to be booked, and b) a landing page which describes the service and makes it bookable. As you can imagine, smaller clients can profit from all four points above, but because they’re time-rich, nimble and cash-poor, it only makes sense for them to pay for someone to deliver the strategy. They have small, efficient teams which can do the operational work themselves. Someone just needs to show them what to do. Bigger clients on the other hand have a lot of cash but need help on all four points. Imagine a company with 60 employees, for example… who is responsible for social proof? Someone in marketing who wants the results? Someone from customer success who will have to get the ok from the customer? Someone from the tech team who will have to implement the social proof on the landing page? Even at just 30 employees and $100k MRR it’s a no brainer to hire a consultant to do that work instead of getting stuck in bureaucracy hell. From the consulting I’ve done before, I know that a typical client can expect to see a long-term boost in sales of 2-10% as a direct result of my social proof optimisation. Smaller clients tend to have worse funnels in the first place, so they can expect better results (>10% or more normally). That means a small client (say, $5k MRR) can expect to increase their revenues by at least $500/month and a medium-sized client (say, $150k MRR) can expect an extra $3-15k of MRR/month. My rule of thumb for pricing consulting services is that it’s a no brainer when the client can reasonably expect to recoup the price they paid within 90 days. In my case, that means I needed a consulting product for small clients providing strategy only but priced under $1.5k. Larger clients also need this (rather uniform) product but also have three other needs (content, implementation, improvement) which vary in size/complexity depending on the client. These larger clients should be paying anything from $10-100k+ per engagement. Because all clients need the strategy part of my consulting services (and because the amount/kind of work do deliver this is pretty much the same each time), I decided to make this the only package bookable on the landing page. I’ll still do more in-depth consulting work with larger clients, but that won’t be ‘productised’. I put together the landing page with a similar design to the handbook and gallery. It’s a static html site hosted for free on Firebase (they also take care of SSL) and styled using a Bootstrap 4 template I heavily adapted. As far as the booking form is concerned, I’m currently using the free tier of Typeform (I’m actually a paying customer, but only needed free tier functionality). The illustrations are from drawkit.io and undraw.co – I edited them slightly to adapt the colours to my colour palette. If you have any questions, feedback or (gasp) want to book my consulting package, shoot me an email or leave a comment below. Vielen Ⅾank! Wollt ich nur sagen.